The assassination of Yitzhak Rabin in November of 1995—one year after he shared the Nobel Peace Prize with Yasir Arafat—sent shock waves around the world. Known as both a man of war and of peace, the Jerusalem-born Israeli prime minister played a key role in developing the Jewish state and was instrumental in establishing peace in the Middle East. Yitzhak Rabin's memoirs, first published in 1979 but long out of print, are now available in this expanded edition. They provide a candid appraisal of significant events in Israeli history, and passages censored when the memoirs were first published have been restored. 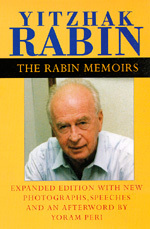 The addition of an afterword by Rabin's political advisor, Yoram Peri, and his most important speeches given after 1979 round out Rabin's life and show the evolution of his beliefs. Rabin writes of his years in the Haganah (the independent Jewish military) and gives a controversial account of the War of Independence. He details the tactical moves that made him a hero in the Six Day War and recalls his years as ambassador to the United States. He tells of his difficult decision to authorize the 1976 rescue of hijacked hostages from the Entebbe airport. Rabin describes the conflicts that eventually led to his party's defeat after thirty years in power, and he concludes with a shrewd assessment of the Israeli-Egyptian peace treaty and of prospects for peace with Israel's other neighbors, including the Palestinians. Yitzhak Rabin's memoirs are important not only for the insider's view they offer about Israel and the Middle East, but also for providing a very human portrait of a heroic world leader. Yitzhak Rabin (1922-1995) was chief of staff of the Israel Defense Forces, ambassador to the United States, and twice Prime Minister of Israel. Yoram Peri was a political advisor to Prime Minister Rabin and Editor-in-Chief of the Labor newspaper, Davar. He is the author of Between Battles and Ballots: Israeli Military in Politics.